My last update was just after the election with a summary of what I thought the impact on the property market would be from the new Labour government. Now we are 4 months in we thought it about time we did a review…and then of course look forward again. Specifically, we said that you can restrict who you let into the country – but there is pent up demand that needs to be met. And…net migration reached record levels of 70,000 – so even halving that is a whole lot more houses, i.e. demand. And…you can only restrict demand to a certain extent before you need to open up the doors to meet the labour shortage. And…you can restrict foreign ownership, but we questioned how much of an impact that would really have on demand given our stats suggest this portion of the market accounts for less than 10% of house purchases. What has the outcome been? Have prices dropped markedly? That doesn’t appear to have happened – according to recent market results. Rather, it seems to me that the nation sat on their hands leading up to the election, then with the change of government – held its breath – then went on holiday, relaxed, realised once again that the world hadn’t stopped and came back in the new year refreshed and looking to do business. For the moment, then, it appears we have a degree of stability in the market place…but let’s lift the bonnet a little. 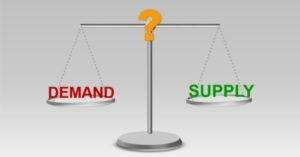 Has there been a significant shift in demand versus supply? Nope – not that I know of. Auckland is still in need of an extra 30k – 50k houses. I am sitting in Queenstown as I write this – agents are hardly struggling to get houses sold. On the supply side, what about the multitude of houses Labour is going to build in the Mt Albert Unitec site. Well its not a million, its 4,000…the point being that there is no evidence that we are about to be flooded with supply. House sales volumes? March 2018 was down about 10% on March 2017. While this might seem ‘material’ – well OK 10% is material statistically speaking – but its down 10% on the highest volume month of 2017. So really this is just a snap shot and not a trend. Days to sell? No real change. Properties on the market? In March there were 26,700 – down from 27,000 in March 2017. So again, not an explosion of supply. Prices? For March the median house price is up everywhere on a year ago except Auckland – which is down 2% to $880k from $900k. Scary price drop? You decide. Summary? Sales volumes are not at levels during the height of the property boom, and prices are not rocketing up. But show me any real evidence the property market is tanking. An arguably stable property market is no reason to get complacent. We should check again and see if there are any property gremlins lurking. On the supply side, unless there are some massive Auckland, Hamilton, Queenstown developments we don’t know of, I don’t see any game changers. And that’s what the market needs. But it’s not about to happen as it has only got more expensive to build – think labour shortage. On the demand side I am not seeing anything that will critically dent demand. Finance has got fractionally easier. RBNZ dropped the deposit requirement for investors from 40% to 35%. Arguably the RBNZ has room to drop it even further, which would lift demand. This is because prices have been stable for some time now, and perhaps more importantly they have forced equity levels in investor properties to greater levels leading up to and across the peak of the market. What about interest rates? For how many years have we heard that interest rate rises are just around the corner. Every time we hear that they seem to head down again, like they have a mind of their own and don’t want to be told what to do. Ironic isn’t it that the bank that was most negative about the property market now appears to be the one most aggressive with mortgage rate specials. I say this because it is a reminder that what is said in the press can often have motives that are not in your interest…remember that journos know that it is shock value that sells papers. Has the appetite of banks for property deals increased at all? It seems that there might be some softening in criteria for housing loans. However there doesn’t appear to be any real increased appetite for lending to developers. That kind of money will need to come from second tier lenders, and it is starting to flow. I sat with an Australian financier earlier this year on the hunt for kiwi property development opportunities. Their money came from Hong Kong and China. Hmmm…have we really stopped foreign investment? More recently the government increased the Brightline test from 2 years to 5 years. This is worth thinking about. Investors make up roughly 40% of the market. The question is how many people will not buy because they were intending to sell in 4 years? There will be some. But largely, unless you are a property trader, you buy property for the long term – about 10 years. I think this is a wait and see. Perhaps the biggest demand consideration is the increasing compliance costs facing the investors. Quite rightly we have had insulation legislation introduced. Now it looks that letting fees will be eliminated. And there is the potential for the government to prevent the off set of losses from property against other income. Will this deter the private investor? Will some investors simply throw in the towel and say too hard? By in large I think the answer to 1. will continue to be yes if you buy wisely. It is affordability that may deter some. But does that mean prices will collapse? Well only if so many people sell that supply exceeds demand. All I can say is please do let me know if you want to sell your property as we have buyers lined up. We believe we are in a steady state phase in the market. There could be some minor bumps over the next year or so, but we aren’t seeing any fundamental concerns…the caveat being a certain country leader twittering badly. Go long…in property…for as long as it looks like demand will outstrip supply in the long term. At the moment it seems supply is will be playing catch up to demand for decades.